Timex Expedition Military Classic "Bullseye"
Not long ago, I described HMT Watches as the Timex of India. Not long after, I realized I did not own an actual Timex of America. Well, not exactly. I do have my 1970s vintage Snoopy watch, but that is not really a fair basis for comparison. It was time to try one from this century and see how it measured up. Connecticut based Timex traces its roots to 1857 as the Waterbury Clock Company. The Timex line of durable, inexpensive wristwatches was launched after World War II. The famous "torture test" commercials of the 1950s, with tag line "Takes a licking and keeps on ticking" made an indelible mark on pop culture. By 1962 one out of three watches sold in the US was a Timex. Fortunes have waxed and waned since then, but Timex survived the horological upheaval of the 1970s and still has its headquarters in Connecticut, although it is is owned by a Dutch holding company. I knew Timex still made the plastic Camper watches, the ubiquitous Weekender, a bunch of digital stuff, and some intriguing fly back chronographs, but I was not prepared for the plethora of watches available on their site. After perusing this extensive collection, I discovered the Expedition Military Classic, Ref. T49821H, which shall henceforth be known as the Bullseye, for obvious reasons. The watch retails for $100 on the Timex site, but is frequently discounted by as much as 30 percent. 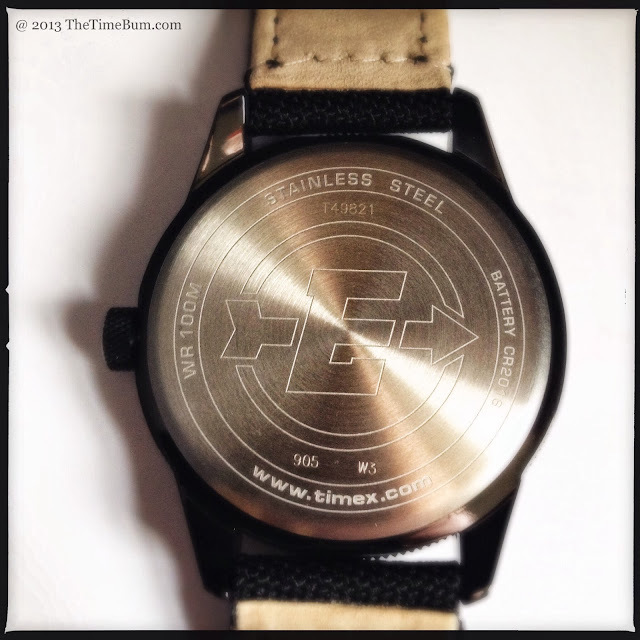 So what does a $70-ish Timex have to offer? As you will see, quite a bit. It was the dial that sucked me in, and I am not alone as it draws complements from all quarters. The concentric red, white, and black motif is a real eye catcher and the black case frames it to great effect. The outermost ring is white, marking the minutes/seconds with 60 boxes and black Arabic numerals in increments of 5. Each box is distinguished with smaller boxes above that alternate black and white. The next ring is bright red and marks 24 hours with white numerals. The innermost ring is black with 12 hours marked in white. 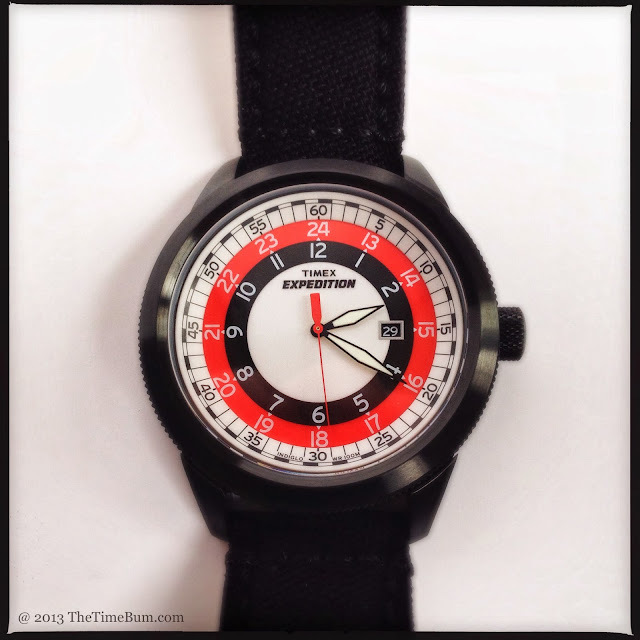 The center is white with the Timex Expedition text below 12:00. It is bold, graphic, and highly legible, but I am hard pressed to find much of a military style to it, save for the 24 hour index and black edged pilot hands. Between the color scheme and the alternating boxes of the angled chapter ring, it reminds me more of a roulette wheel. By any name, it is a treat to look at. A red second hand and black 3:00 date wheel complete the picture. The hands have a bit of weak illumination on them, but the real night time show is provided by the Indiglo electroluminescent night light. Just press the crown and voilà! 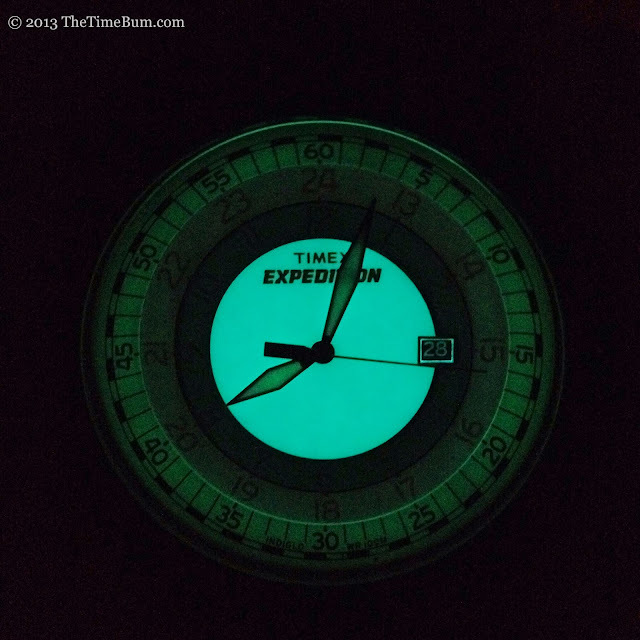 The dial lights up with a bright blue-green glow. It is a very cool effect and hard not to play with. The round case is 44mm wide and 13mm thick, but thanks to short, tapered lugs and a generous, beveled bezel, it wears more like a 42mm. Unlike many of Timex's less expensive (or shall I say, even cheaper?) offerings, the case is stainless steel, not plated brass. Timex does not say what method is used to create its black coating, but it is matte black over a brushed surface, and evenly applied. The flat mineral crystal is recessed into the bezel, a thoughtful detail that affords it some protection from chips and scrapes. 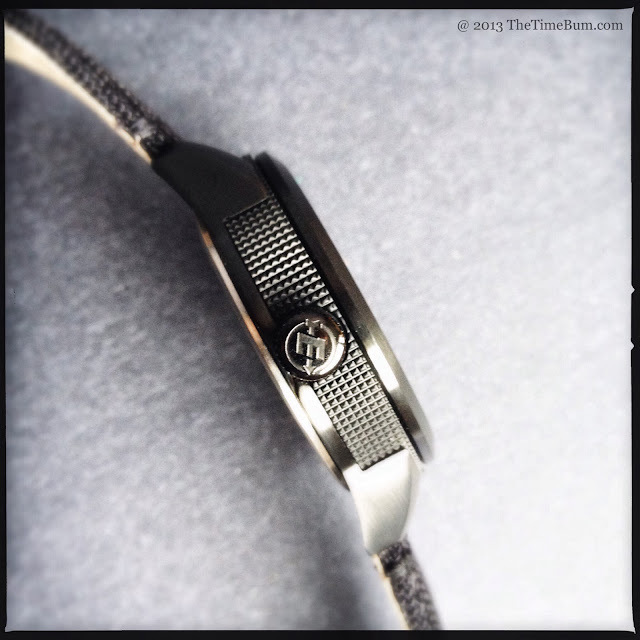 The case sides have a knurled texture, even between the lugs. This serves no purpose that I can tell, but it looks fantastic. The texture is repeated on the chunky 3:00 crown, which is also decorated with an engraved Expedition logo consisting of an italicized "E" with an arrow. You will also find the logo engraved on case back. Water resistance is a very useful 100m. It seems the vast majority of Timex watches have straps that are 20mm or smaller. For the Bullseye, Timex went with a 22mm lug width, which I find to be more proportionate to the 44mm case. The strap is black Cordura, backed in leather. 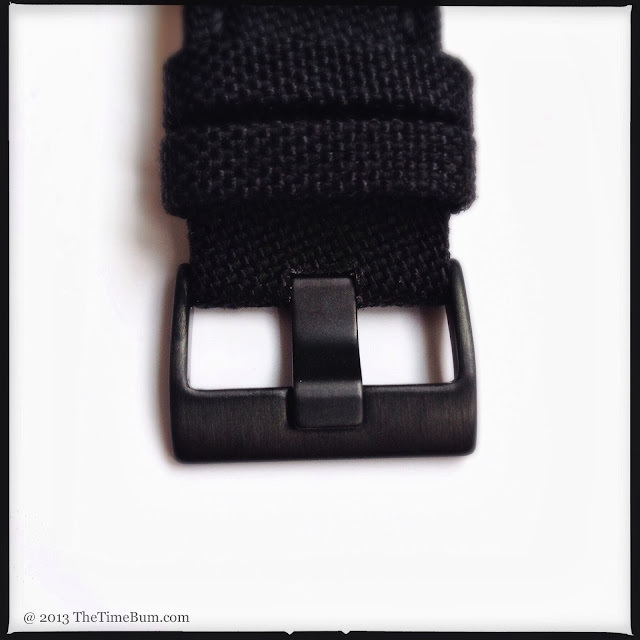 It tapers to a 20mm buckle with a wide, flat prong. It is a very nice strap, and frankly, much better than the nylon or canvas straps I have found on similarly situated Citizen and Seiko watches. Time Bum readers know I am a crazed strap swapper, but I think I will leave this one alone for the time being. Really, it is that nice. An in-house quartz movement keeps the time accurately and without fuss. I have heard that Timex movements are loud, but I have not found that to be true of this model. Much to my delight, the second hand hits every mark, something I have found lacking in quartz watches costing far more. I confess, I am a watch snob. 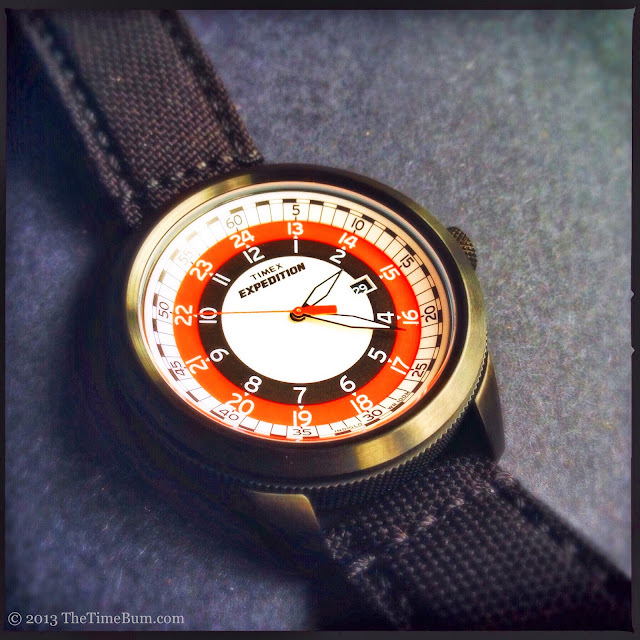 I dismissed Timex for years as a disposable, dime-store watch, unworthy of my wrist. Boy, was I wrong. What I have on my wrist right now is a solid, stylish watch that just happens to be a remarkable bargain. Con: Having to explain, "Yes, it really is a Timex"
Sum: What's not to like? The Time Bum enthusiastically approves.